Based on traditional food storage cupboards of the eighteenth and nineteenth centuries, this hardwood cabinet features hand-punched tin panels and a milk paint finish. 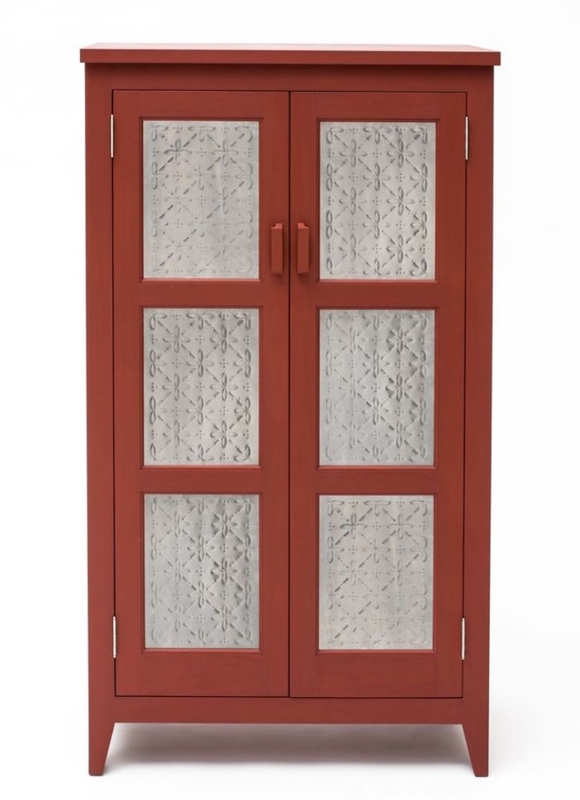 Its elegant proportions, crisp joinery, matte finish, and decorative tinwork combine to create a beautiful focal point in any room. As a freestanding piece of kitchen furniture, the pie safe provides ample storage for dishes and kitchenware, dried goods and preserves, and, of course, for pies. Its shallow profile fits easily in many spaces, and five adjustable shelves offer flexible storage options. The back is fully finished and divided into three vertical panels. All design, tinwork, woodwork, and finishing by Miriam Linder in Portland, Oregon. Color: Pictured here is a clay-red wash. Other colors include dark green, deep blue, and warm yellow. Dimensions: Height 54"; Width 30-3/4"; Depth 13-3/4"